Tens of thousands of cheering fans turned Madrid's main streets into a sea of red and waited for hours in blistering heat to see Spain's World Cup heroes pass by with the trophy on an open-topped bus. The triumphant team who beat the Netherlands in the final in South Africa flew home on Monday and set off on a tour around the Spanish capital after visiting King Juan Carlos and Prime Minister Jose Luis Rodriguez Zapatero. 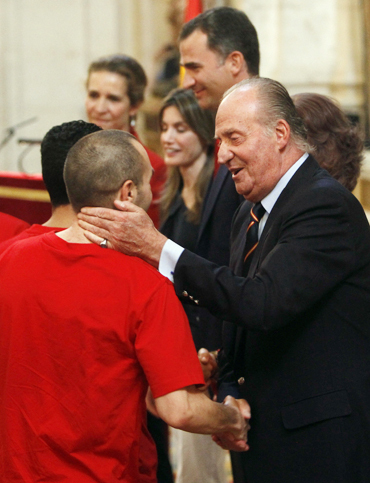 "You are an example for new generations for your effort and the spirit you showed in overcoming the odds," the King said in the Royal Palace. "You made our best dreams come true," he added. Crowds were packed in so tight in an open space near the Manzanares river, where the victory tour ended, that city officials made public pleas asking people to stay away. "We are here to take part in history," said Pedro, a 33-year-old fan waiting for the arrival of the bus at the Madrid fountain Cibeles, where hundreds of thousands had watched Andres Iniesta's winning goal the night before on a giant screen. Parents waited patiently with toddlers in buggies. As the crowd glimpsed the bus approaching, many began singing a popular supporters' song: "I am Spanish, Spanish." Nearby, someone had sprayed a Volkswagen Beetle car yellow and red like the Spanish flag. The players wore red T-shirts with "world champions" emblazoned across the front, waved flags, and took photographs and videos of the red-and-yellow mass of fans lining the pavements, while music thumped out from huge speakers. Supporters called out for goalkeeper Iker Casillas and sang "Villa, Villa, Maravilla", Marvellous Villa, in honour of striker David Villa, Spain's top scorer in South Africa. Their final destination was a 31,000 square-metre plot of land by the river Manzanares where a stage was mounted for a night of entertainment. At Manzanares, fireman sprayed water over the fans to cool them down in the heat and the party was expected to go on well into the night. The festive mood in Madrid started last Wednesday when fans surged on to the streets after the semi-final win over Germany, with some groups pretending to bullfight passing cars by waving red Spanish shirts and flags at them. On Sunday night, two people died after the final, one person falling from a balcony and another drowning in a pool. Spain's success at the World Cup is providing a welcome lift to morale in a country where one in five people are unemployed and the government has had to pledge steep cuts to please investors who have worried about Spain's public deficit and private sector debt. Spain's Industry Minister Miguel Sebastian hoped the World Cup victory would attract more visitors to Spain the same way Italy experienced a boost to its tourist industry from its 2006 win. 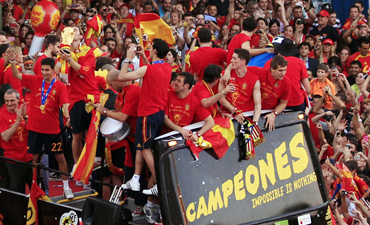 "Hundreds of millions of people have seen the colours and the brand of Spain", he said. "Imagine what that is worth (in marketing terms) all the hundreds of millions of people who have seen those images," he added.